If you need parts for your John Deere Compact Utility Tractor, we have what you're looking for here at Green Part Store. Rare and hard-to-find parts are no problem for us, as we have access to a huge inventory and can get you exactly what you need. If you know the part number of the part you need, you can enter it into the Part Search Box above. 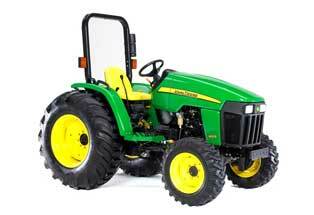 Otherwise, select the model number below that applies to your John Deere Compact Utility Tractor. We have parts for all models available, with our selection encompassing everything you need for repair and maintenance of your John Deere Compact Utility Tractor from any year. Our selection includes cab door hinges, tractor seat repair supplies, engine oil filters, coolant heater kits and more crucial parts you may be looking to replace. We also have accessories like ballast box extensions, hitch sprayers, off-road utility lights, and anything else you might need to outfit your tractor. If you're looking for something you don't see here, please contact us — we still have tons of parts and accessories waiting to be added to the website!